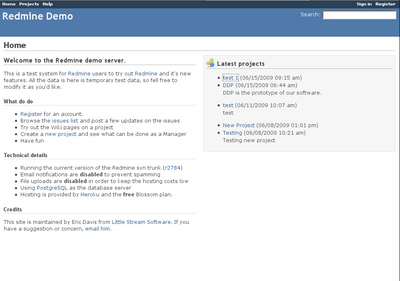 Redmine 0.8.5 was released on September 13th, 2009. This release is a point release which includes some security fixes found in Ruby on Rails 2.1.2 and some bug fixes in Redmine. If you're running an older version of the Redmine 0.8.x series, it's recommended that you upgrade as soon as possible. Once you've upgraded, you might notice that the version is still called 0.8.4. That's a mistake, we forgot to increment the version number when it was tagged. The Ruby on Rails core team announced two security vulnerabilities in Rails on September 3rd. These were a XSS Vulnerability and a Timing Weakness when using the cookie session store. 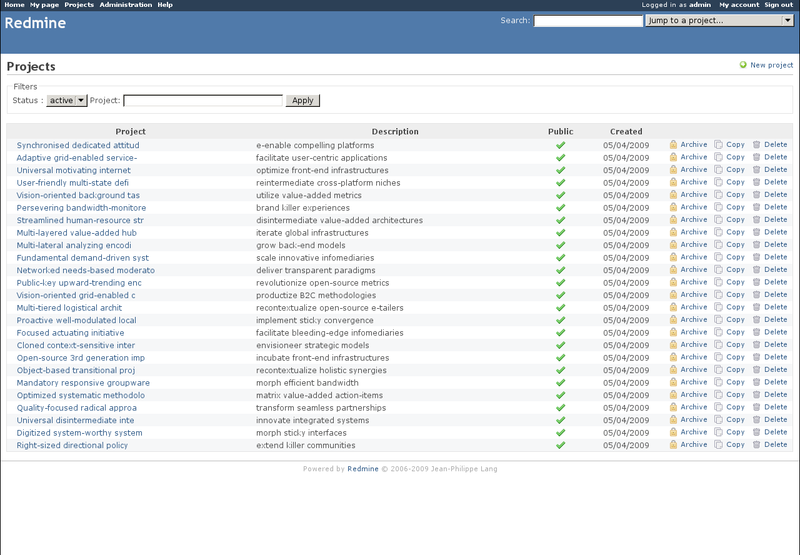 Redmine 0.8.5 includes the patched versions of Rails in the official download. If you are running the Subversion version, it's strongly recommended that you patch your Ruby on Rails installation. script/about is used to print information about the current Redmine environment, such as the versions of Rails and the database. 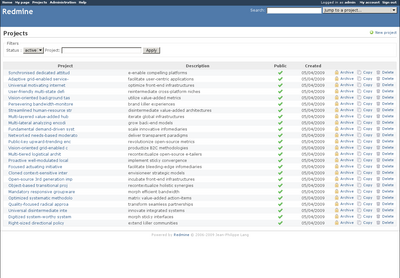 0.8.5 has enhanced script/about to list the currently installed Redmine plugins and their versions. This should make it easier to get help on specific plugin versions. Update: I forget to merge this feature into 0.8.5 so it's not part of this release. It will be in 0.8.6. The Subversion adapter received a few tweaks in this release. Now when Redmine is fetching data from the Subversion server, it will run non-interactively and will not cache authentication. This will prevent problems where svn hangs while waiting for a response from the user. 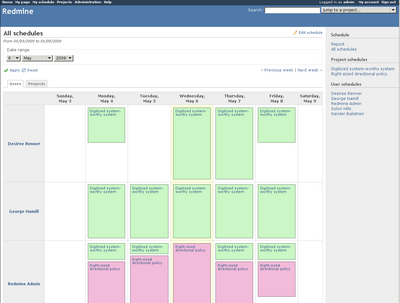 Now when a closed issue is linked to, Redmine will strike-through the text and also color it in a lighter gray. This makes reading a long list of issues a lot easier. See issue #3495 for a before and after screenshot. When using an incoming mail handler with Redmine, keywords can now have a space before the colon. Some mail clients will insert a space before the colon so Redmine wouldn't recognize the keyword. If you'd had a problem with your email keywords not getting recognized, it should be fixed in 0.8.5. 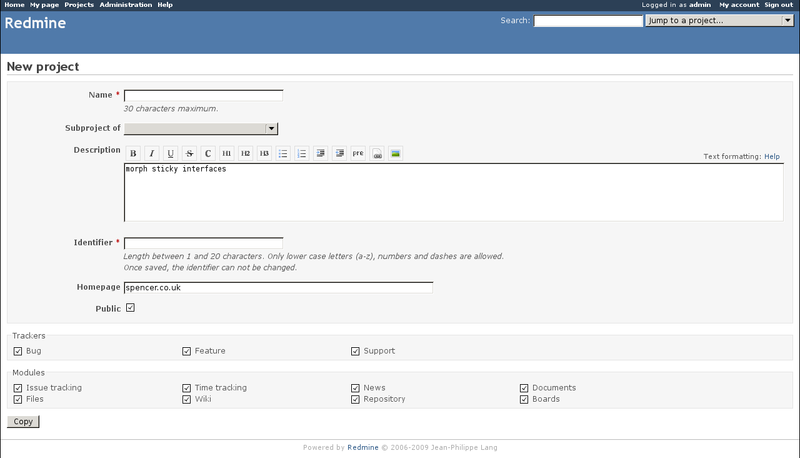 To see all of the changes in 0.8.5, check out the Changelog posted to Redmine.org. Last night I migrated RedmineBlog.com to the Jekyll engine. The blog has been running on Mephisto but I was finding it difficult to actually write due to the various the bugs in Mephisto. Jekyll will make this easier, so I'm hoping to post more frequently. I converted all of the comments to Disqus, so the previous conversations are still available. Disqus is a hosted commenting service which has a lot more features than the built in ones in the old blog. I'm hoping this will make this site more valuable to each of you. So if setting up Redmine has held you back from evaluating Redmine, fear no longer as the demo server is waiting for you. If you do decide to start using Redmine and would like some help setting it up, send me an email and I'll see what I can do to help. I recently had to opportunity to work with Joe Clarke of SourceRepo.com to add Redmine to their service. SourceRepo.com provides source code repository hosting for Git, SVN, and Mercurial. Now, depending on the plan you choose, you will have access to a full Redmine 0.8 install. 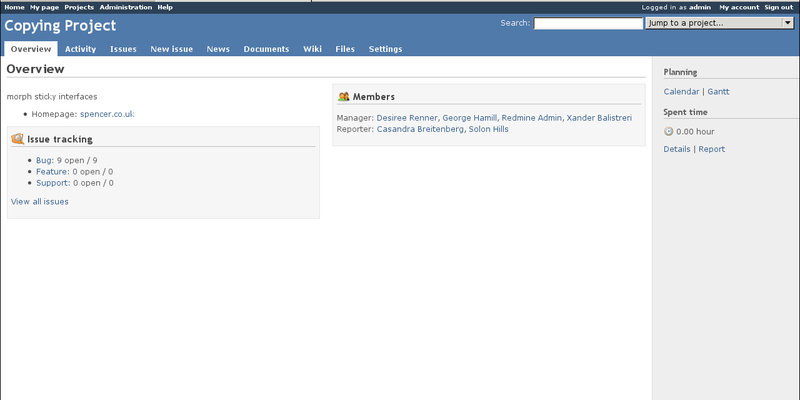 SourceRepo.com also has an exclusive feature for Redmine right now. It will be released to the general community soon but if you want to try it out, you will need to sign up for an account. I'll give you a hint, it has to do with "themes" and "uploading". 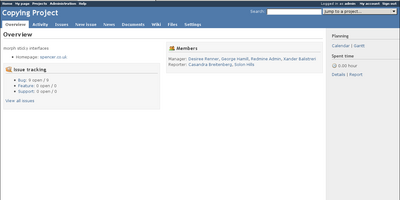 I'm happy to have another company support Redmine and provide an easy way for users to get Redmine up and running. If you are looking for a place to host your Redmine, give SourceRepo.com a try and let them know you heard about them from here. 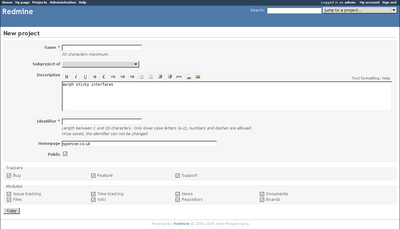 Recently the ability to copy a project was added to the latest Redmine. I thought it would be good to do a quick overview of how it the feature works along with a few screenshots of the process. 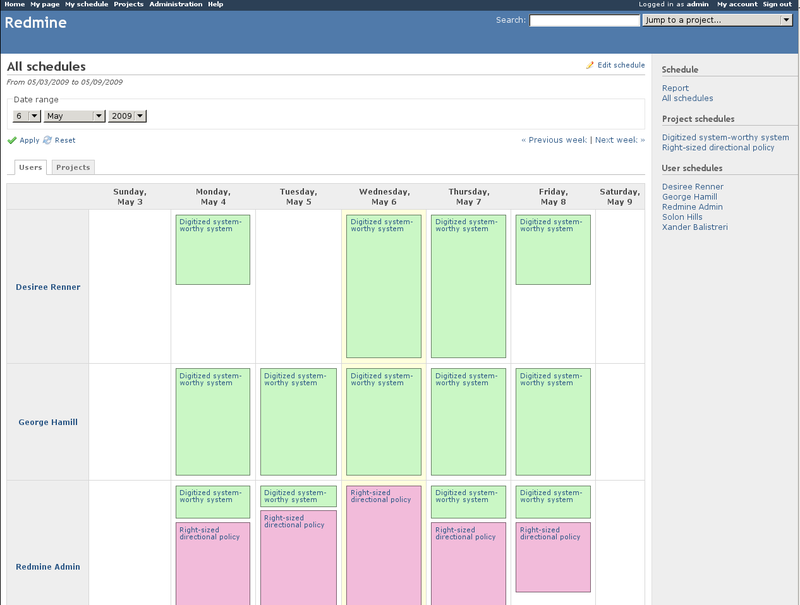 Issue #1125 on Redmine.org has more details and discussion about the feature. There are basically three short steps to copying a project. 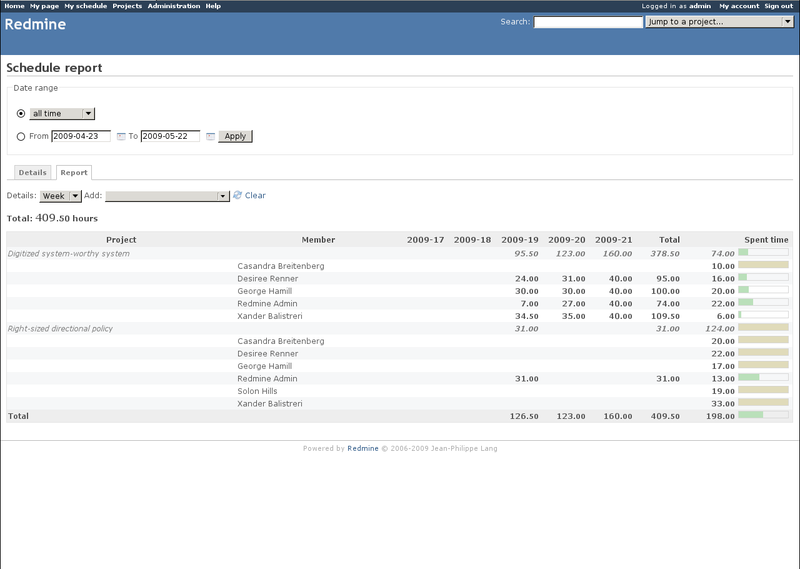 There is also a plugin hook included so plugins can add data to copy easily. 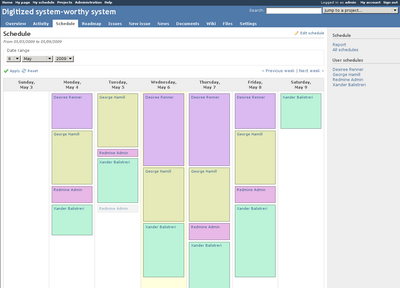 I've already modified the Redmine Budget plugin to copy Deliverables. To select the project to copy, just click the "Copy" icon in the Projects panel, under Administration > Projects. After starting the copy, you will be presented with a form for creating the setting of the copied project. 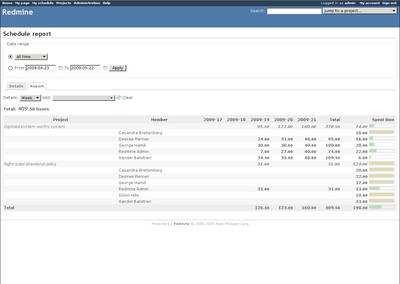 This form is populated with the data from the source project but it can be changed before submitting. Once the settings have been setup, submit the form and move onto step 3. At this point you will now have a new project based on information from the source project. As you can see in the screenshot above, there was 9 issues and 6 members copied. This would be a good time to review the copied data to make any changes that are needed. Both projects are completely separate, you don't need to worry about changing something in one project and having it affect the other. That's all there is to this feature. 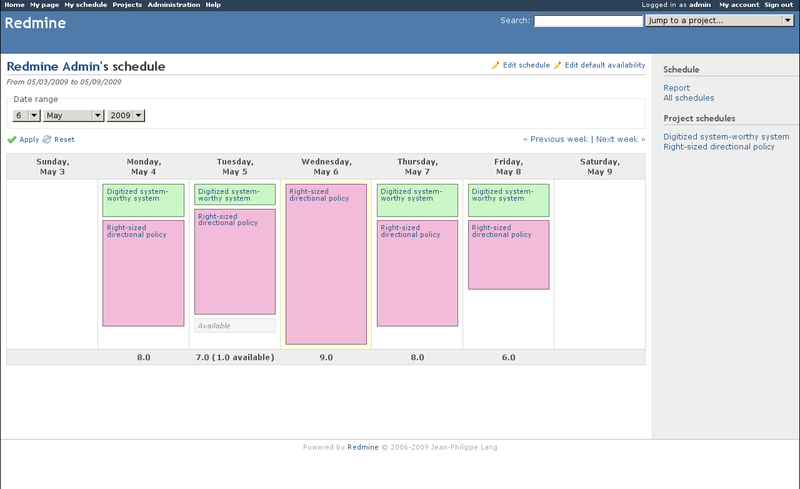 It's scheduled to be released in the upcoming Redmine 0.9.0. If you have any suggestions for improving it or have found a bug in it, please open a new issue on Redmine.org. There's been quite a discussion about setting up Redmine to use GMail's SMTP server for sending emails. I've seen this being a pain point for a lot of people so I've decided to write up a set of directions on how to get your Redmine setup to use GMail's SMTP. I've tested this process with Redmine 0.8.3, 0.8-stable, and trunk (r2670) using my personal GMail account. The action_mailer_optional_tls_plugin adds a TLS option to Redmine's emailing library, ActionMailer. TLS is a version of SSL which is required by GMail in order to send email. One important thing to watch, is that this file only uses spaces. If there are tabs anywhere it in, Redmine will not be able to read the file correctly and you will not be able to connect to GMail. -> "220 mx.google.com ESMTP 28sm495064wfd.5\r\n"
-> "250-mx.google.com at your service, [0.0.0.0]\r\n"
-> "220 2.0.0 Ready to start TLS\r\n"
-> "250 2.1.0 OK 28sm495064wfd.5\r\n"
-> "250 2.1.5 OK 28sm495064wfd.5\r\n"
-> "354  Go ahead 28sm495064wfd.5\r\n"
-> "250 2.0.0 OK 1239665113 28sm495064wfd.5\r\n"
-> "221 2.0.0 closing connection 28sm495064wfd.5\r\n"
If you're curious about what the connection is saying, any -> is GMail talking to Redmine and any <- is Redmine talking to Gmail. The important thing to see is where GMail responds with a 250 status code near the end of the connection. This means that the connection was successful and that the email will be delivered. About a minute later, I saw the test email in my inbox from GMail. If you follow this set of directions, you can easily setup GMail with Redmine. If this was helpful, please let me know in the comments or suggest a new article.